Great Place to Work, a globally operating consulting firm based in the US with branches in 58 countries, just recently revealed the results of their latest study “50 Best Places to Work in Peru 2017”. Publishing the annual Fortune “100 Best Companies to Work for” list for the US and numerous Best Workplaces lists around the globe, Great Place to Work aims at building, sustaining, and recognizing high-trust, high-performing workplace cultures by giving companies their research, consulting and training tools at hand to assess themselves, transform and offer better places to work in order to promote a better work environment and gain a competitive advantage. In Peru, where many companies still struggle with good practices and valuing their workforce, and then again with productivity, motivation and enthusiasm, it is essential to build excellent places to work to achieve higher levels of competitiveness and growth that allow the country to escape poverty and further progress. 174 companies in Peru and more than 150,000 employess participated in this years 16th edition of the study “50 Best Places to Work in Peru 2017”. Some of those who made it onto the list are “oldtimers” being on the list for years such as for example Interbank, Supermercados Peruanos (Plaza Vea, Vivanda), Casa Andina and Inkafarma (by the way all belonging to the same business group), Ripley and Saga Fallabella; some are companies making it for the second consecutive year such as Cencosud, Sodimac – Maestro, Martin Engineering and Teva; and a few are ”newcomers” such as Compartamos Financiera, Prados Chicken, Primax, Servicios Cobranzas e Inversiones (SCI), Asbanc, Mall Aventura, AFP Habitat, Magic M&L and Interfondos SAF. 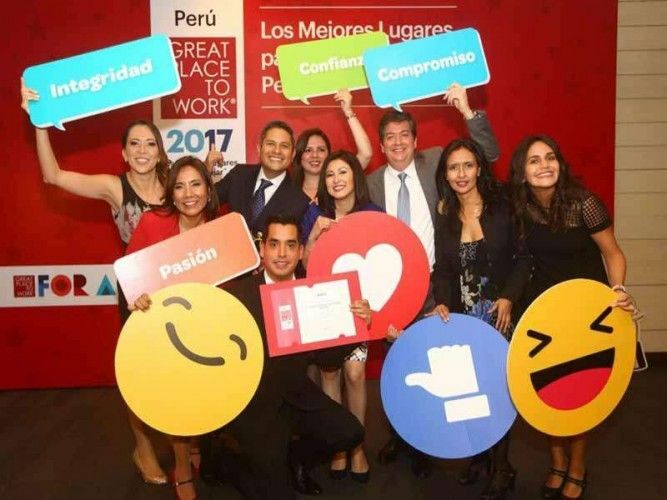 Here’s the full list of the “50 Best Places to Work in Peru 2017” divided in 3 categories: more than 1000 employees, between 251 and 1000 employees and between 25 and 250 employees.